Almost everyone is familiar with the upright, thick, uniquely coloured leaves of the Sansevieria plant, also referred to as the Snake plant or Mother-in-Law’s tongue. This is a hardy plant suitable for lower light areas of the office or home. It is available in a number of varieties exhibiting a wide range of colourful markings on the leaves. ‘Zeylanica’ has many shades of dark green. ‘Laurentii’ displays bold yellow stripes on the leaf margins, and ‘Moonshine’ has pale green, almost solid colour leaves. Cylindrica is a very unique variety with cylindrical, striated leaves. It is a favourite of designers. A very new cultivar is the bizarre Shark’s Fin. It is usually sold as a single fat leaf in the pot. Sansevieria as a single specimen in a tall, graceful pot gives a very architectural appearance. The small dwarf varieties work well as understory plantings, ground cover, or border plants in large planters. Mass plantings of Sansevieria can be very striking. We often use Snake plants in large rectangular planters as living space dividers. 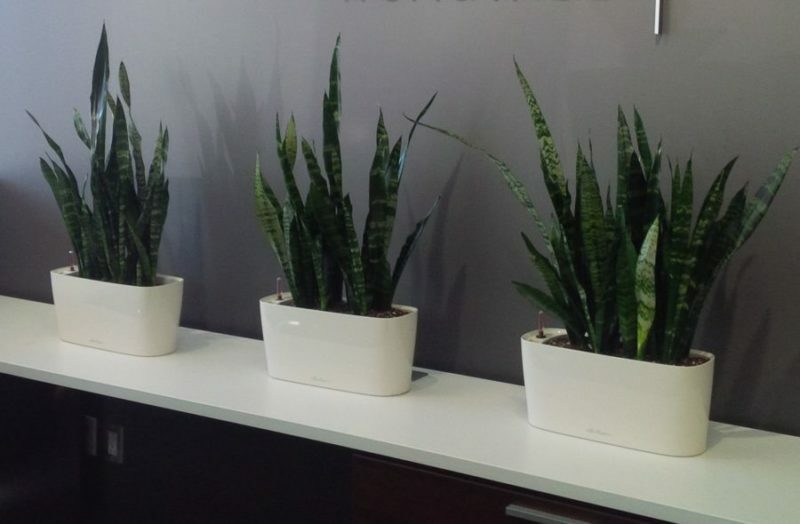 Most of our office plantscapes include several varieties this this plant as it is a favourite with designers and is a popular plant for the office. This plant can tolerate fairly low light levels, although it does require light for a few hours every day. It needs very little water, and does best when allowed to dry out thoroughly between waterings. It will rot quickly if left standing in water for long periods. It is a slow growing plant that does not need to be pruned often. Remove dead leaves promptly, and cut any excessively tall leaves at soil level. This is a hardy, disease and pest resistant plant. If stressed, it may occasionally get mealy bug. Remember to fertilize monthly during the spring, summer and fall. 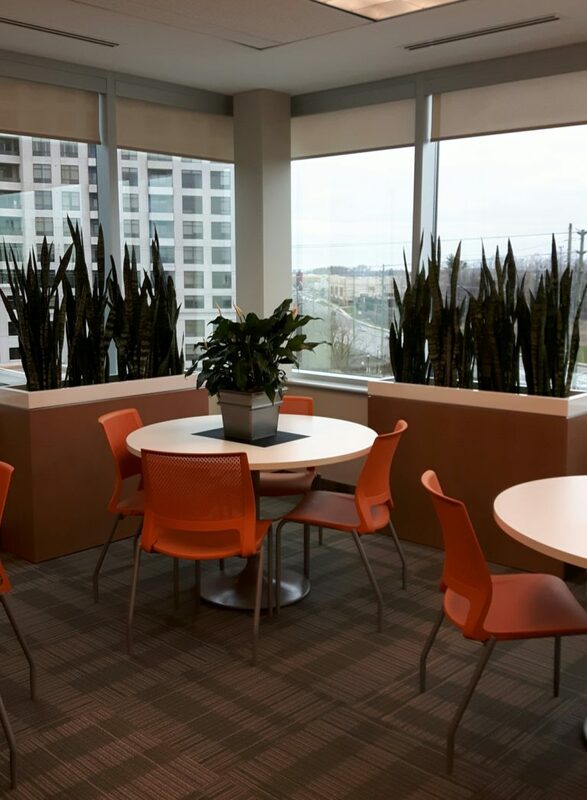 Snake plants in custom planters frame a lunchroom in a Vaughan office.